Cat lovers love cat photos, whether they are their own cat’s photos or photos of other cats. Cat-inspired photos are so popular that there are even whole sites devoted to sharing cat photographs. There are also several popular books showcasing photos of felines. And of course, photos of cats grace cat magazines and newsletters. Naturally, cat-inspired photos can be a wonderful cat lover gift. Luckily, there are several gifts you can create using photos. Here you’ll find lots of gift ideas using the pictures of your cat (or your friend’s cat) as well as tips on how to personalize your presents. Plus, you’ll find tips and pointers to take great photos of your pet. 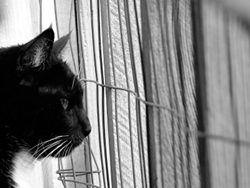 -- Take a great photo of the recipient’s cat and give it as a gift. You can frame it using a unique cat-themed picture frame. I personally love black and white photographs. They look so elegant and sophisticated. Another idea is to have the photo enlarged and use it as wall art. -- You can use several photographs and make a collage. A great idea is to use photographs depicting different stages of the recipient’s cat’s life. Or if your cat-loving friend has several cats or pets, use different pictures of each pet to create your collage. -- Another idea is to create a calendar using a photo of your cat. Go to our cat calendar page for more ideas. -- You can customize a t-shirt using cat photos. Several websites now let you to do this. They allow you to upload your own pictures and choose the design. For more ideas to customize your cat t-shirts, check our page about cat t-shirts. -- Other clothing items you can customize with your own photos include sweatshirts, shirts, and aprons. -- In addition to t-shirts and other clothing items, you can personalize other articles using photos. For instance, you can customize throws, totes, pillows, jewelry, key chains, magnets, and even tapestry. Several online stores offer this service. -- Other accessories and articles you can customize using photos include: mugs, cups, hats, mouse pads, food and water bowls, and even stamps (that’s right). Indeed, you can have lots of fun using cat photos. -- For a more sophisticated gift, you can have you cat photos transferred onto canvas. Visit our pet portraits page for more information on pet portraits. -- Another idea is to create an album using several photos and give it as a gift. You can even find cat-themed photo albums. -- A variation of the album idea is to create a scrapbook using the recipient’s pet pictures. Make your own cat photo book: That’s right, several online stores allow you to create you own cat photo book. You upload your favorite photos, select the style and can even design the cover. This is a fabulous idea for the budding photographer. And, of course, this is a great cat lover gift idea. Pet portraits have grown in popularity in the last few years, and there are many fine portrait artists online that specialize in pet portraits. A pet portrait makes a wonderful cat lover gift. Most artists require a photo of the recipient’s pet in order to do a portrait. For additional information, check out our pet portrait page. -- Decide before hand what type of photo you want: Do you want to capture your pet’s personality, do you want to photograph him in action, do you want to showcase his antics, or do you just want to capture her beauty while she lays down in a sofa or chair? Do you want an indoor or an outdoor shoot? -- Photographing your pets requires lots of patience, so plan ahead and schedule as much time as necessary. Keep lots of treats and toys on hand. -- Another option is to have your camera always handy to capture all those candid moments. -- Natural light is always best, but if you are taking pictures indoors make sure that you have plenty of light. An alternative is to position your pet near a window from which lots of natural light come in. -- Take lots of pictures; later you can pick the best shot. -- It is a good idea to shoot at your cat’s eye level, unless you want to use a different point of view. However, shooting at eye level is good if you want to use the photo to be turned into a portrait. -- Personalized cards: In addition to a personalized gift, give a personalized card. There are a few online stores that give you the option of using your own pictures to personalize your cards (Holiday, birthday, thank you cards and much more). -- Customized stationary: This is another cool idea, especially for those of your friends who love to send notes and letters. Again, there are several websites that allow you to upload your own photos and design your own stationary and address labels.